The latest swashbuckling adventure starring everyone’s favorite drunken goofball pirate with a seemingly never ending well of good luck has, if anything, proven the franchise’s diminishing returns in terms of box office. Despite being panned by critics and western audiences, On Stranger Tides turned in a tidy profit primarily through its international box office numbers, and the same is expected here, but the numbers are down. Part of that is, no doubt, due to franchise fatigue despite a 6 year gap between films. Who would’ve thought we’d have a 5th Pirates film - with a rumored 6th in the works - nearly 15 years after the release of the original? Let’s remember this is a franchise based on an amusement park ride. If 3 films hadn’t dried up the well in terms of available source material, why not try 3 more? Much like past Pirates films, Dead Men Tell No Tales has a grating tendency to find a few jokes it likes and repeat them over and over in the hopes that it either gets funnier with repetition or if it weren’t funny the first time it might be after they’ve tried reworking it a number of times. However, usually it ends up getting a laugh at least once and then wears out its welcome soon after. The most notable case is the film’s play on that era’s witch hunts in which a smart female character frequently shows off her intelligence to a group of dumb men who immediately assume she’s a witch. At first, I thought, “eh, that’s sort of a funny commentary on that particular part of history,” then the film continued to poke at it every time the character interacted with a man on screen and the bit turned into an annoyance. Much of the rest of the time Dead Men Tell No Tales comes off as a caricature of the original trilogy. This is Johnny Depp’s signature role, yet with each film the performance feels more and more like an impression of the performers working at Disney parks doing an impression of Depp’s original performance. And yet even the story, by Terry Rossio and Jeff Nathanson, feels like something of a caricature. Rarely does the film cover ground the franchise hasn’t already covered, and when it does try something new it does it poorly - usually because it rushes through it far too quickly. It manages to bring back many of the familiar characters from past films no matter which corner of the world they might have been. It includes another cursed pirate seeking revenge against Jack Sparrow for some past slight. It features a Commodore Norrington wannabe and a Tia Dalma wannabe - both of whom could have been cut from the film without consequence. It also features a pair of young love interests and more superfluous side characters than even 2 writers and 2 directors knew what to do with. This time the new additions are stronger than the ones from On Stranger Tides, but that’s admittedly not saying much. They include a strong-willed female lead (played by Kaya Scodelario) not terribly dissimilar to the role Keira Knightley played in the original film, and a young man (played by Brenton Thwaites) with some specific ties to the previous films, who amounts to the same sort of bland, straight-laced male lead Orlando Bloom played. 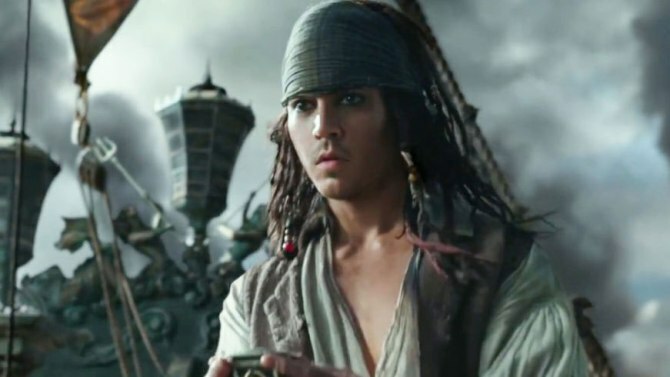 They both, and Jack Sparrow, continually find themselves captives of either the British Navy, ghostly pirates, or even members of Jack’s angsty crew - who are, again, at their wits end with Jack’s inability to lead them to a big payout. Of course, they always manage to escape no matter how many people are after them. By now we’ve seen Jack manage enough last second escapes in this franchise that the writers stopped attempting to write any sort of fear or tension into these scenes. 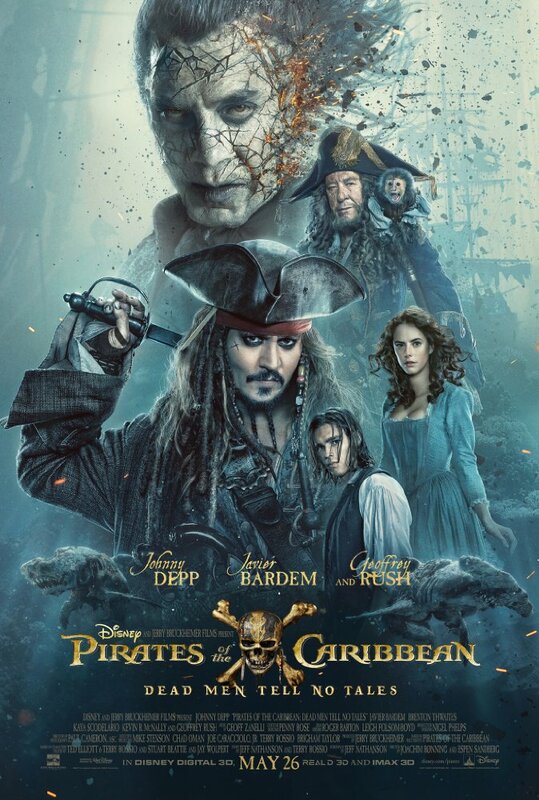 The new villain, the ghastly Captain Salazar, played admirably by Javier Bardem, is essentially a mixture of the undead pirates of the first film and the grotesquely fishy crew of Davy Jones in the second film. The special effects used to create them are eye-popping indeed, but unlike the skeleton crew of the Black Pearl or even Davy Jones and the Flying Dutchman, the backstory that explains Salazar and his cursed crew is muddled at best. Much like On Stranger Tides, there is no sword fighting to speak of in this film. Yes, occasionally characters draw swords, but the series stopped doing big choreographed fight scenes some time ago. Here, when swords do supposedly cross, the action is handled in post production with sound effects and incomprehensible editing. Also like On Stranger Tides, the film suffers because too much of the journey is dependent on hurriedly introduced characters we’re still trying to decide whether or not we like by the time the film is attempting to give them some sort of emotional payoff. It’s telling that this is the shortest film in the franchise yet so much of it still feels like excess. Replacing some of that excess with a bit more development for the new characters could have made a big difference. For instance, Jack’s introduction is an extended heist sequence that involves his crew trying to pull a large safe out of a bank only to inadvertently pull the entire structure off its base. While it affords the film some visual gags and slapstick humor and ends in a fairly clever fashion, it goes on far too long. Meanwhile we don’t even learn the new female lead’s name until fairly late in the proceedings. I may be coming off a little harsh on the film, however, while it’s deeply flawed, I genuinely don’t think it’s all bad. It is, for what it’s worth, an improvement on the 4th film (which is, in my opinion, the worst so far). In fact, I’ll be the first to admit I have a nostalgic fondness for the first trilogy. Yes, they’re campy and completely over-the-top but they’re fun adventure films that I, as a high school student, loved if only because my interest in pirate lore, history and mythology had reached its peak as the movies were exploding in popularity. The clever ways the writers could work in fantastical pieces of pirate mythology with elements of real pirate history, yet still produce a dark but fun, engaging and comical, family friendly yarn hooked me every time. So, inevitably, there are still things to like here for fans of these guilty pleasures like myself (it is decidedly not popular to like these films). Firstly, there’s the National Treasure-esque search for items of both historical value and mythological importance - in this case it’s the search for the trident of Poseidon. There’s also the return of, and reconciliation of, a story thread left tragically unresolved by the first trilogy. And then there’s a flashback to a young Jack Sparrow that helps explain how he got his name, and many of his iconic personal effects. However, I suspect the walk down Jack Sparrow’s memory lane may bother more viewers than it will impress. For one, it’s not a particularly compelling story, and it also seeks to explain that which may have been better left unexplained. The first Pirates film frequently has characters comment on Jack’s peculiar mannerisms and manner of speaking. Yet the film wisely offered jokey speculation without ever committing to a solid explanation. It added an air of mystery to him that’s all but lost now after 5 films. That sums up every film in the series and the franchise as a whole. There’s some fun to be had, but there’s a lot of excess. It has a way of both charming the audience and wearing them out at the same time. Disney’s continued milking of the franchise is only losing them fans at this point. That’s a painful admission to have to make for someone who genuinely used to love the series. The diminishing box office returns (especially domestically) only illustrates how quickly this ship is sinking.